• new theoretical concepts that can stimulate further development of science. Submitted work should be original, has not been published elsewhere and corresponding to subject-matter of the Journal of Foreign Legislation and Comparative Law. Materials, submitted concurrently to two or more publications, are not reviewed, and relations with author are terminated. The length of the article should not be less than 10 000 words. Pages should be numbered. Typeface is Times New Roman. Line spacing is 1,5. Font size for main text is 14, for footnotes — 11. Footnotes should be numbered page-by page, numbering is consecutive. Abbreviations and reductions should be expanded at their first usage in text, and legal instruments should contain the date of adoption, number and full official name. Source of publication of normative acts should not be specified. Specification of source of citation, factual and numeric data is mandatory. Work should be submitted as a single file and comply with the following structure. 2. Metadata in English (the requirements are the same as the metadata in Russian). • scientific apparatus and bibliography. Bibliographic references are made according to GOST (State Standard) 7.0.5-2008). The list of references should only include works that are cited in the text and have been published. 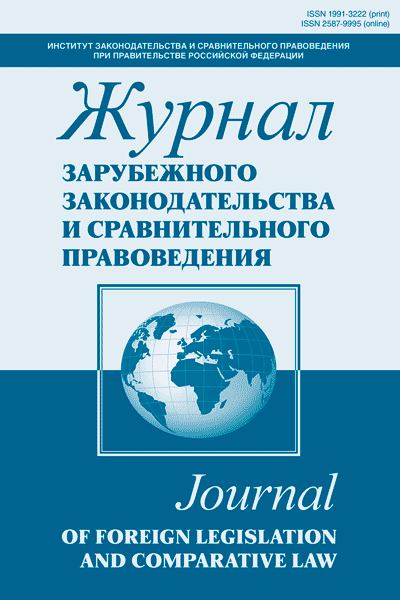 Articles should be sent to an e-mail of the editorial office: jzsp@izak.ru (own surname and the word "article" to be specified in the subject matter of the letter). All articles submitted to the Editorial Office of the Journal are subject to review. When a positive review is received, the article is submitted to a meeting of the Editorial Council to decide on publication in order. If someone of the of the members of the editorial board won’t be agree with reviewer's conclusions regarding the possibility of publication of the article the final decision on the matter shall make an Editor-in-Chief. In case of refusal to publish an article, the Editorial Staff sends a motivated refusal to the author. Article, approved to publication, is subject to edition and proof corrections. Alterations and reductions of manuscript of editorial character should not be approved by author. If actualization of manuscript or approval of conceptual editing is required author should be obliged to reply to the Editorial Staff in specified term. ​​​​​​​In case of positive decision on possibility of article publication the Editorial Staff send author an e-mail to specified electronic address. Before signing a contract author shall have a right to revoke article by notifying the Editorial Staff via e-mail. Contracts should be send by simple letter to the postal address of the Legal Publishing House "Norma": 9A, Kolpachnyy lane, Moscow, Russia, 101000. Peer-review and publication of articles is free of payments.